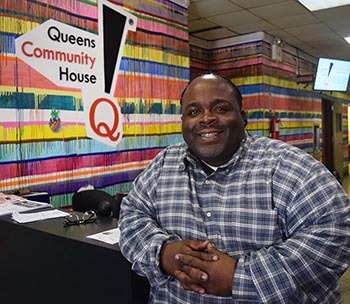 Queens Community House is proud to announce the appointment of Patrick Pinchinat to Pomonok Site Director. As Site Director, Pinchinat will be responsible for building partnerships, both within the Pomonok community and with outside entities, so that QCH can expand the resources available to the community and offer access to services QCH does not provide. Previously, Pinchinat worked as the director of QCH’s Beacon Program in Forest Hills. He brings with him 20 years of youth development experience and is a recipient of the PASE Setter Award issued by the Partnership for After-School Education. As Beacon director, Patrick earned a city-wide reputation for successfully integrating civic engagement and organizing skills into his program’s design. Pinchinat is eager to connect with the broader community and bring more activity to the Pomonok center for residents of all ages. “My ultimate vision for the center is to build comprehensive services for individuals and families and to develop more intergenerational activities, engaging all residents from Pomonok and beyond,” he said. QCH has operated the Pomonok Community Center since 2006, serving more than 1,500 Pomonok residents and nearby neighbors each year through a senior center, after-school and summer camp programs, summer-long teen programming, and a variety of intergenerational food access/healthy eating initiatives. But it has always been a goal of Queens Community House to reach more broadly and more deeply into the Pomonok community and to offer a wider range of services that align with QCH’s role as a settlement house. QCH believes that their all-inclusive approach will ultimately increase residents’ chances for long-term success and build greater individual, family, and communal self-sufficiency.